In a rare coup for such a new website, White House Dossier has scored its first major scoop, and it’s a huge one. White House Dossier, through unnamed, highly placed sources who are also close to the issue, has procured the new draft of the Iran nuclear sanctions agreed to by the United States, Russia and China. These sources spoke on condition of anonymity to avoid having their asses immediately fired. 2. Lebanese kabobs will be declared superior to Iranian kabobs. 4. The song “I Ran” by Flock of Seaguls will henceforth be played at all international sporting events in which Iranian athletes are awarded the gold medal. Reaction from the Iranian leadership was mixed. 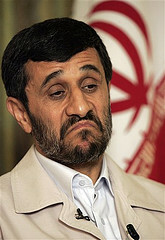 “Ow, you’re really hurting me,” said Iranian President Mahmoud Ahmadinejad. But Iranian Supreme Leader Ayatoallah Ali Khamenei expressed some concern. White House Dossier has learned that to gain Russian’s acquiescence in the deal, Hillary Clinton, in a startling acknowledgment that the administration’s new posture toward Moscow had failed to turn Russia’s leaders into reasonable people, met secretly with Foreign Minister Sergei Lavrov last week at the Kremlin. 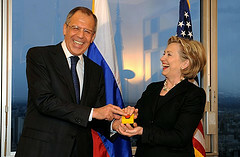 There, Clinton and Lavrov pressed the Reset Button AGAIN. With the reset button – which for an awkward 20 seconds was stuck in the down position before popping back up – having been re-pressed, the Russians were ready to deal. Noting that the United States was seven days late on its last payment – two days past the five day grace period – Hu threatened to jack up the rate to 19.8 percent and assess a $40 fine – for every $10 of debt. Nevertheless, State Department officials say the new sanctions represent a major setback for Iran and a victory for the cause of nonproliferation to countries that would gladly give terrorists nuclear weapons to set off in Times Square. Good stuff, particularly Freedom Rugs and the conversation between Hu and Clinton.